Here’s another one of my promised appetizer recipes; stuffed button mushrooms! These bite sized babies are scrumptious, and I actually got a round of applause from the guests! Now that is success. I usually find stuffed button mushrooms to be a little too rich and cheesy for me. This recipe has the perfect balance of flavors. 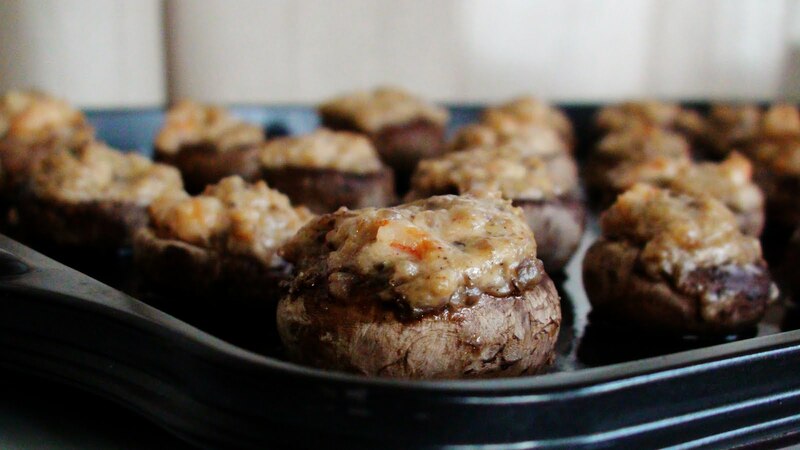 And they are perfect for a dinner party because you can prepare the filling in advance and fill the mushrooms and leave them in the fridge and pop them in the oven when your guests arrive. Twenty minutes later, when the kitchen is smelling heavenly voila, stuffed mushrooms fit for a King! Preheat the oven to 350 degrees F. Grease the baking sheet with cooking spray. Clean the mushrooms (using a damp cloth or paper towel.) Remove the stems from the mushrooms (sometimes this can be a bit tricky, but once you get the hang of it all goes well!) Set aside the caps and stems. Add the stems and garlic to a food processor and pulse in brief bursts until finely chopped. Heat the oil in a large skillet over medium heat. Add the mushroom caps and garlic and cook for about 5-7 minutes or until all the moisture has disappeared. Add in the shrimp and turn heat down to medium-low. Stir in the cheeses and spices. Mix together until the mixture is smooth and creamy. Spoon the mixture into the mushroom caps and bake in the oven for 20 minutes. Serve immediately.